Looking down, I saw the cover of Harry Potter and The Sorcerer’s Stone. She was being so sweet, I immediately agreed. Even though I had no real interest in it. The Christian/LDS Romance genre held the key to my literary heart–not a children’s fantasy book. 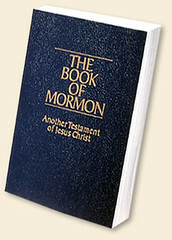 But I figured it wouldn’t hurt and I could use some lighthearted entertainment, so I took it home and read it. And then. I asked my friend for the next one. And the next one. And the next one. Charming even joined in the fun. Sitting down together, we read it outloud after the kids were in bed. Sometimes I would sew or cover paper back books for the kids or back up pictures on Flickr while Charming read. And sometimes he would restore and assemble a new swing set for the kids or weed the garden or wash the car while I read. I pelted him with questions and declared my predictions while he smiled and refused to reveal what he already knew of the endings. And I absolutely marveled at the detail. And the depth. And the intricate plot lines. How could she do it? How could she so neatly tie up the ends of each novel, while still propelling you forward into the next one? By the time we reached the final novel, Charming cut me loose and gave me permission to read it on my own. And I finished it today. I cried so hard at the end of chapter 23 that Bubbers kept asking me during breakfast, “Are you done crying now? Are you okay, Mommy?” And when I left a mournful message on Charming’s work phone, he thought I was faking my tears. But I wasn’t. What a friend. What a dear, dear friend. And about 15 minutes after I finally finished it, I fell asleep. The exhaustion of the Harry Potter roller coaster had finally ended. And I could feel every page of it in my droopy eyelids and achy head. Until then, take care my friends! Hee hee. The same thing happened to me when I read Harry Potter two years ago. I thought it looked silly. But I loved it, and my husband actually read them all, too. Hey Christy!!! I didn’t know you had a blog–I’d love an invitation! Oh, I’m glad I’m not the only one who read it so late in the game and loved it. :) I can’t believe how much I miss them all. 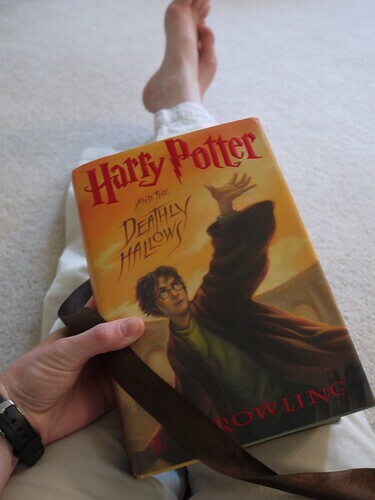 I feel like I’ve lost my best friends without any more books to read about them–good ol’ Harry, Ron and Hermoine! And Fred and George! They were my favorites. Did you and your husband read them together? No, we read them separately. He works strange schedules, so we never had time together for reading. Your boys are so sweet! You can have an invite if you send me your email address. Good to hear from you! I was also captivated by Harry Potter. I joined between when the 4th and 5th book were published. I am in the middle of reading them again. Such amazing stories. My older kids have read them too, and I can’t wait for the younger ones to discover the joy of Harry Potter. BTW – if you want to watch any of the movies, I’ve got them all and you are welcome to borrow them. Thanks for the invite, Christy! I love being able to “see” you and your beautiful family!